Hello everyone! Today I have a mini Pretty and Polished swatch spam for you. These photos were taken at different times, so my nails look a little different in each of the sets. Pretty and Polished is one of my favorite indie brands. Chelsea is so innovative with her polishes, and really works so hard on her line. I'm sure you are all familiar with her greatest hits (Jawbreaker, anyone?)! Let's take a look at some of the polishes you may be slightly less familiar with! This photo shows three coats of Cyber Kick on its own. It's beautiful, isn't it? Next up we have Jealous. I have it layered here over Illamasqua Viridian. It is hard to show in photos -- Jealous is what is creating the beautiful golden flecks on top of the green polish. It is superfine, glowy shimmer, like fireflies in a faraway field. It really looks like it's lit up. I bet it would look just beautiful over black or a dark dark blue. This one hasn't been listed in a while, but Chelsea said she will be putting some up in the next opening! Finally, we have Pool Party. This is a more recent shade by P&P. 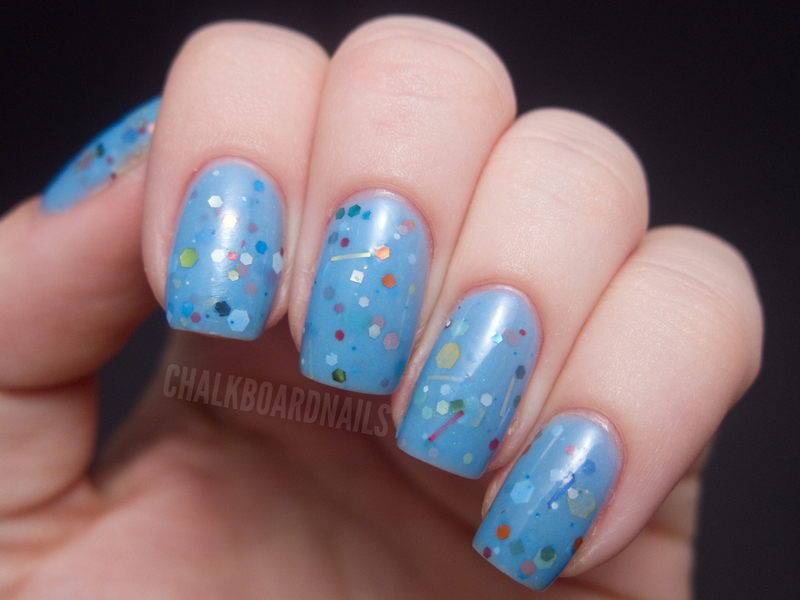 It's a clean sky blue base with tons of multicolored glitter in it. I actually wore Pool Party to a pool party and it got a lot of compliments! I have three coats on here, I believe. It's sheer, but that allows the glitter to have layers of depth. THE LAYERS! I had no problems getting the glitter to apply nicely with this one. It's quite a well rounded polish -- beautiful AND easy to use! You can find Pretty and Polished on Etsy, Facebook, and Blogger. Chelsea will be opening her shop next Thursday the 21st at 7:30pm EST, but you can keep up with her Facebook page for polish teasers and future restock notices! I like your blog and your nail polish designs. I have linked your blog to mine. I have a fashion and beauty (goodness only what I talk about) but have a page now for my favorite blogs instead of a blog roll. You are on it! I'm so sad Chelsea has stopped international orders. I own Jaw-breaker, galax-e, black swan & tuesday taurus. I love it all! Glitters is ♥ for me! Chelsea's polishes are amazing! I was lucky enough to get pre order before she put a hold on international orders. Hope she can ship internationally soon, I still want more of her lovely creations. Wearing jawbreaker right now and love it! i want side kick... lovely! I like all these. Unfortunately I don´t own any of them. I just fell in love with Cyber Kick! All three are pretty but I'm in love with Pool party, it's just gorgeous! I love all of these colors!!! Every time I see someone post Pool Party I immediately get the Aquabats song stuck in my head. I own a lot of them but out of the 3 you stowed. I own pool party.